Terrestrial Ecosystems is a specialist environmental science and wildlife research consultancy based in Perth, Western Australia. It was established in 2002 on a strong research foundation that focuses on improving terrestrial fauna surveys for ecological impact assessments (EIA). Terrestrial Ecosystems prides itself on providing a high quality product at an affordable price and within agreed timeframes. The active partners are Dr Graham Thompson and Dr Scott Thompson. Both partners have a PhD (zoology and environmental science/management) and maintain the company’s strong commitment to continual improvement based on robust research and rigorous science. Scott is a Certified Environmental Practitioner (EIANZ), and was the 2007 EIANZ young professional of the year and a 2017 40under40 award winner. peer review of fauna reports. Terrestrial Ecosystems’ fauna assessments and fauna surveys are used to support EIAs, Native Vegetation Clearing Permit applications, referrals to the Commonwealth government under the EPBC Act (1999), monitoring impacts on fauna and developing effective fauna management plans. Terrestrial Ecosystems has a comprehensive range of fauna survey equipment (e.g. 4WD, field trailers, cage and aluminium box traps, pit-traps, motion sensitive cameras, ultra-sonic bat call detectors, etc) and is therefore capable of undertaking large scale fauna surveys, fauna relocation or fauna monitoring programs. Terrestrial Ecosystems has two field equipped (e.g. GPS, UHF radio, fire extinguisher, bash plates, etc) quad bikes, one mine spec’d Yamaha Rhino ATV and two custom built trailers suitable for use behind the quad bikes or Rhino. These vehicles are mounted on trailers that are equipped for access into remote locations. These ‘go anywhere’ vehicles enable Terrestrial Ecosystems’ staff to access remote areas and to assess a diverse range of habitats that are typically inaccessible to 4WD vehicles or on foot. Terrestrial Ecosystems has two field equipped and mine spec’d 4WD vehicles and two custom designed and built field trailers. Terrestrial Ecosystems’ staff have undertaken multiple fauna surveys and assessments in remote locations. Terrestrial Ecosystems are well equipped with satellite phones, tents, swags, off-road trailers and camping equipment, fuel and water storage to complete multiple weeks at a time in the field. Terrestrial Ecosystems safe work practices and protocols are also set up to adequately manage staff safety and project outcomes whilst in remote locations. Terrestrial Ecosystems has all of its own trapping and animal detection equipment, including large and small cage traps, aluminium box traps, funnel traps and pit-traps. This enables us to mobilise for field surveys at short notice and know that the equipment will meet the requirements of the fauna survey. We regularly deploy our five ultrasonic (SM2BAT+) and two Anabat bat call detectors during fauna assessments. Terrestrial Ecosystems has 100 Reconyx motion and infra-red sensitive cameras that can be used to detect the presence of rare and endangered species (e.g. Bilbies in a burrow, Northern Quoll on a rocky outcrop), feral cat activity at an active Malleefowl mound or for long-term monitoring of Malleefowl mound use, burrow use and feral cat and dog, or dingo activity. Terrestrial Ecosystems staff are experienced in setting these cameras and have developed an appreciation of their limitations and how to obtain the best results. 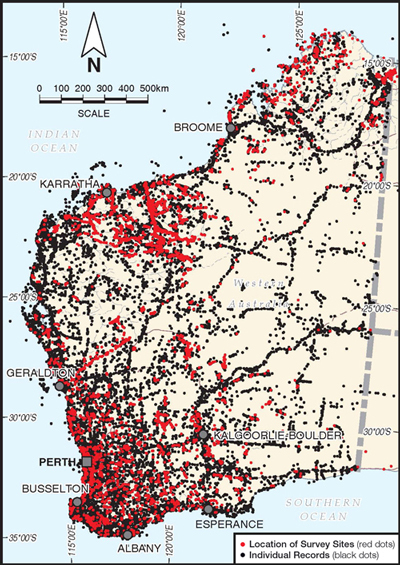 Terrestrial Ecosystems has the largest and most comprehensive, privately owned vertebrate fauna survey database in WA. This database produces reports in a format ready for inclusion in fauna assessment reports, which enables Terrestrial Ecosystems to provide better quality assessments at a lower cost. The partners have in excess of 100 publications in journals, books, book chapters or conference proceedings. Topics include fauna surveys and assessments, EIA, ecology, physiology and morphology of reptiles, amphibians, fish and mammals (give web address). In 2010, the partners published a book ‘Terrestrial Vertebrate Fauna Assessments for Ecological Impact Assessment’ which is freely available on our Fauna Book webpage. Terrestrial Ecosystems carries public liability, professional indemnity and workers compensation insurance.